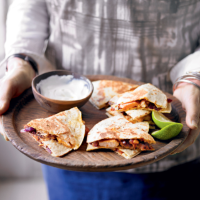 Quesadillas are a classic Mexican dish of flat tortillas filled with a savoury filling with cheese and then pan-fried or griddled. Ideal as a snack or finger food when cut into wedges and served with a dip or as the ultimate Mexican sandwich. 1. Mix the chicken and chipotle paste together. Heat the oil in a large frying pan and fry the chicken and onion for 5 minutes. Add the pepper and fry for a further 5 minutes until the chicken is cooked through with no pink meat. 2. Meanwhile, heat the refried beans in a small saucepan for 1-2 minutes, stirring. Spread 4 tortillas with the beans, scatter over the chicken mixture and then cheese and place the remaining tortillas on top. 3. Heat a small frying pan with a little oil and fry 1 quesadilla for 1-2 minutes until golden, place an upturned plate over the pan and flip over, replace back into the pan and cook for 1 minute. Keep warm in an oven while you make the remaining 3 quesadillas. 4. Cut each into 6 wedges and serve with the soured cream or some guacamole and tomato salsa.